The Castexpo'13 American Foundry Exhibition co-sponsored by the American Foundry Society and the North American Die Casting Association was held in April 6th -9th,2013 in St. Louis, the United States. Being the largest exhibition of professional casting technology, products and industry trade in the Americas, the American Foundry Exhibition displayed the world's most advanced casting equipment, instrument, excellent castings and casting materials from all over the world. Professionals from more than 20 country and regions attended the exhibition. 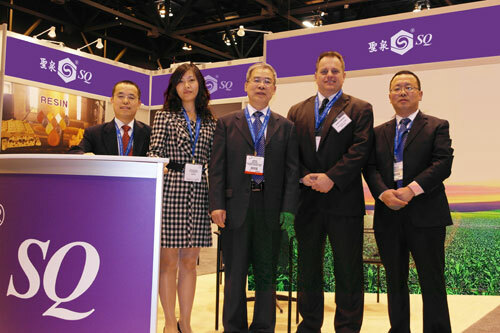 Led by the General Manager Zhu Jianxun, Shengquan Group participated in the exhibition. Compared with the last exhibition in 2010, the North American foundry industry has been recovering significantly with castings upgraded to the higher value-added. The demand for high quality, inexpensive and environmental protection materials keeps increasing . Numerous casting professionals from the United States, Canada, Mexico, Brazil, Chile, Peru and Colombia etc. visited our booth. With reception to the friends in casting industry from all over the Americas market, we strengthened communication with old customers and demonstrated our products to the new ones. During the exhibition, we maintained better relation with the predecessors and the industrial leaders, made sufficient exchange of industry information with the peers, which would further promote the business development in Americas region.